Richmond, London - March 28, 2018 - LAT Images, the live event arm of Motorsport Images with the largest staff presence at international motorsport events, has been conferred an international news photography award this week. The prestigious Istanbul Photo Awards spans all manner of news photography, with recent category winners documenting subjects as varied as 'Escaping from Danesh' to reportage from West Africa during the Ebola crisis. Among the varied judging categories are sports, nature, news portraiture and environmental photography, with the awards adjudicated by an international panel of experts including Paris Match's Digital Editor, Marion Mertens and Cameron Spencer, Chief Photographer at Getty Images. LAT Images won second place in the 'Single Sports' category. 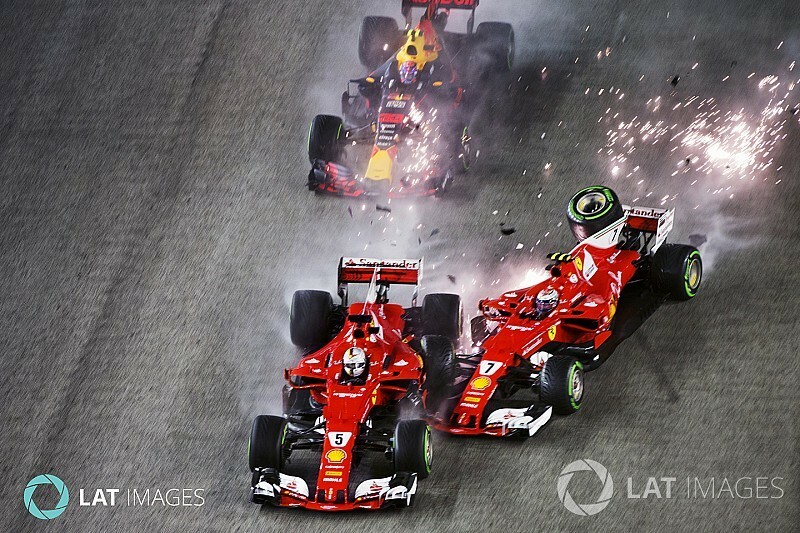 Andrew Hone's compelling image captures a precise moment of high drama at the start of the 2017 Singapore Grand Prix as Ferrari teammates Sebastian Vettel and Kimi Raikkonen collided on the opening lap. Framing the exact moment of impact made the image one of the standout sports news photos of last year, and also epitomised the fortunes of Sebastian Vettel as his retirement from the race eased Lewis Hamilton's pathway to a fourth driver's championship. Andrew Hone is a veteran Formula 1 photographer who has just commenced his fourteenth season covering the sport. As part of a ten man LAT Images team that attended the 2017 Singapore Grand Prix, he explained how the photograph was composed. "Formula 1 is photographed from every conceivable perspective, so at LAT we make it our mission to find a new and fresh way to capture every race by conducting thorough reconnaissance and pre-event planning. On this occasion, we managed to secure police permission to access the Benjamin Sheares Causeway as a vantage point. It is an elevated motorway that looks down on the start/finish straight, but it is usually out of bounds as the carriageway is live with city traffic during the race." "Observing the start from above, I could almost foresee the collision happening - Raikkonen had a strong start and Vettel was looking defensive. The picture itself was not technically too difficult, shot on a 70-200mm that is quite versatile - it was just a matter of keeping everything in the frame and tracking it smoothly, but I knew as it unfolded that it was an opportunity to capture a defining moment. You know instantly that you have something special and those moments come along only too infrequently." LAT Images has the most comprehensive and best resourced trackside presence in Formula 1 and many other international motorsport series. The company is part of Motorsport Images, owned by Motorsport Network and holds an automotive and motorsport library spanning 125 years and 18 million images. The group recently added the Rainer Schlegelmilch and Sutton Images archives to its collection.